The major challenge paper plants confronted with is to reach high yield production of uniform pulp quality and high-grade paper with lowest consumption of chemicals and water. Leizhan’s supply range from providing or rebuilding individual equipment or some parts of the system to supplying an entire turn-key. Scope of supply range form stock preparation to the reel section. Leizhan provide customized design for the customer from the conveying of waste paper to the forming of the fine pulp. The pulp processing contains the following parts: conveying(i.e. chain convey), pulping(i.e. drum pulper, D type hydrapulper), cleaning(i.e. high density cleaner, low density cleaner), screening(i.e. pressure screen vibrating screen), and refining(i.e.Double disc refiner, conical refiner). The fluting paper manufacturing system contains headbox, wire section, press section, dryer section, pope reel. 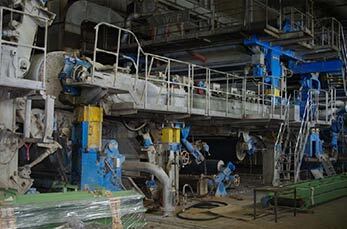 Every section of the paper machine will be well designed to meet customers’ needs. Leizhan will offer trainning service and send experienced engineers to support and instruct our customer’s paper production line from designing, erection to comminssioning. Leizhan experts and engineers support is at-the-ready for the customer.